A packed crowd at the Aesthetic Realism Foundation in SOHO listened intently as famed transit photographer and historian John Stern and his wife gave a talk entitled “The New York Subway: A Century!” to mark the 100th anniversary of the New York City subway system. ERA Online was credited with helping to publicize the event, and the article on John Stern (below) was quoted. An illustrated transcript of John Stern’s 2004 talk, “The New York Subway: A Century!”, is available. Click the link below to download a free PDF. Alan Hannock, a past ERA president and NY Division chairman, passed away on October 6, 2004, at age 75. In the past few years Alan was confined to an adult residence or nursing home because of a stoke and other medical problems. Alan was a leader of both the ERA and the NYD in the 1950s and 1960s. Because Alan had neither living relatives nor an estate, the boards of the Electric Railroaders’ Association and the NY Division paid for Alan’s burial expenses. Fortunately, one of our members remembered that Alan’s parents were buried in Woodlawn Cemetery in the Bronx, and arrangements were made to have him interred there. A ceremony was held on October 19, 2004, with several of Alan’s friends in attendance. It is now easier to navigate ERA Online. Transit News has become What’s New and is now the first section you visit after the Welcome page. Publications is now Sprague Library and includes information about our picture collection (see next article). Finally, Membership has become a much more inviting Join the ERA. If you’ve been patiently waiting for the next issue of Headlights to arrive in your mailbox, you’re in for a treat. The January-June 2002 issue of Headlights has finally been published! 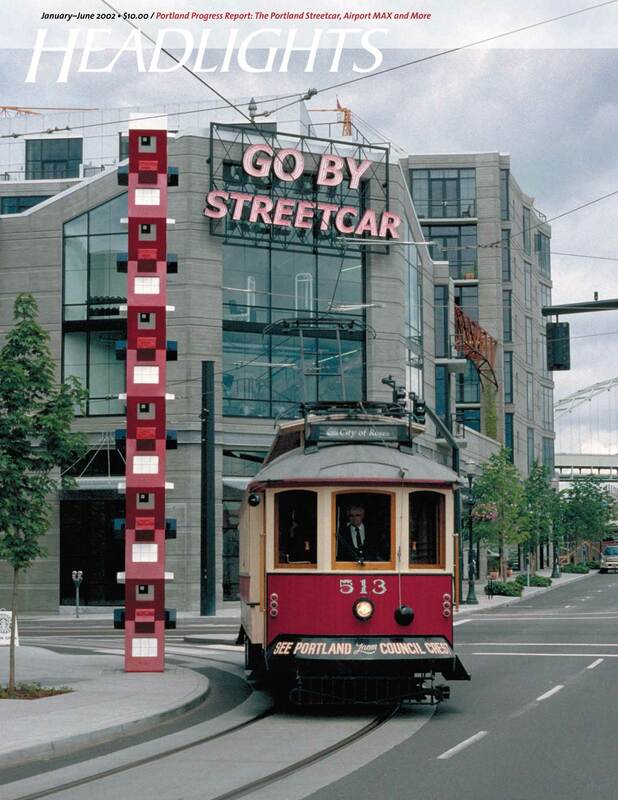 This whopping 36-page issue revisits the Portland Streetcar with beautiful photos by Frank S. Miklos and Ray Berger. It features a full-page map by Sandy Campbell of the Portland Streetcar and MAX Light Rail routes and reports on MAX extensions and Vintage Trolley happenings. As usual, every other spread is full-color. This is the first issue of Headlights created with Adobe InDesign CS. This state-of-the-art page layout program features layer transparency, native Photoshop and Illustrator file import and OpenType support, capabilities which are raising Headlights production to higher levels of excellence. Previous issues of Headlights were produced using QuarkXpress. It is now easier to find a topic on ERA Online. We’ve added a Google search button at the bottom of our pages which is so thorough, it even examines our sample Headlights PDFs. Give it a try!